Bernstine has been making paintings, drawings, and sculpture since 1980, while living in the East Village of New York. Self-taught as an artist, he moved downtown after completing a master’s degree in International Affairs at Columbia University. In the East Village he was part of the music, art and literary scene and published the underground magazine Newave. Bernstine left New York for Los Angeles in 1984, then on to Paris in 1988. Since then, he has been based in France, also spending time in London, Marrakesh, and Berlin. While continuing to make art, he worked a variety of day jobs, finally devoting himself full-time to art-making in 2007. 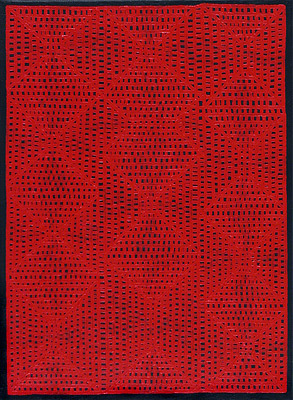 The artist repeatedly explores a variety of visual motifs: gossamer webs and grids of fine lines with undulant movement; concentric geometric patterns; accumulations of discreet grid zones and rectangular shapes; accretions of tiny rectangles resembling tile work or aerial views of imaginary topographies; and energetic and colorful bursts and vortices. In black-and-white checkerboards, Bernstine twists and torques the patterns and fills in the background with parallel stripes. This lends the work a distinctive optical vibrancy as well as visual richness within a limited palette. In other examples, a central checkerboard is executed in two colors and set against a striped ground creating a distinctive spatial push and pull. One large-scale work on paper is included in the exhibition, a diaristic creation combining a variety of motifs in a single work. Because of space constraints in his home/studio, it was created piecemeal without a clear overview, allowing chance to dominate the decision making.